This big boy has to be in the 6m/18ft or larger range. He ripped off the hind quarter of a zebra, tilled up his head and, swallowed. Shot from the Mara Triangle bank just below Mara Serena Lodge. Not a human friendly river bank, that's for sure! Dramatic image - well captured. Sadly we lost an Aborginal Ranger in the far North last week - she was taken by a croc that was later killed - with her body inside it. 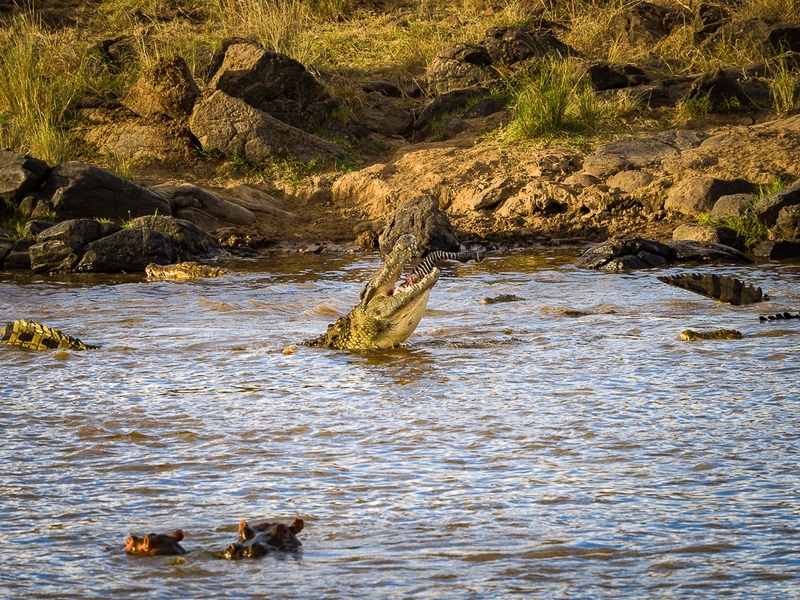 In times past hunting reduced croc numbers considerably, but hunting has been banned in recent years and as a result the numbers of crocs have increased considerably. Excellent capture. Not so nice for the zebra, but croc's need to eat too. I am not sure how you were able to get this shot, a lot of patience, skill and luck I presume. Sorry to hear about the ranger. It's a dangerous job for sure, as crocodiles are sneaky, moving silently and striking fast. I'm glad we don't have them to worry about in California.